Why the Name and Why Now? As most people know, I’m a Senior Editor at a publishing company. For the past 10+ years I’ve spent most of my time editing, planning, doing uncredited writing, and interviewing people from all walks of life (Candace Cameron Bure, Max Lucado, Adam Wainwright, Matthew West, Rend Collective, just to name a few), but I’ve long wanted an avenue where I could write just for the joy of writing. Those who are my friends on Facebook know I have a tendency to post statuses that are more like essays, so I felt like it was time to seek out a better option. I can’t promise you’ll love what I write; I can only promise that I’ll write. I hope you’ll check in time to time, comment, participate in discussions, and let me know that someone is reading this other than my mom. And if you really love me, you’ll enter your email to follow along with my upcoming posts. I have no idea what’s to come, but I’m looking forward to it! 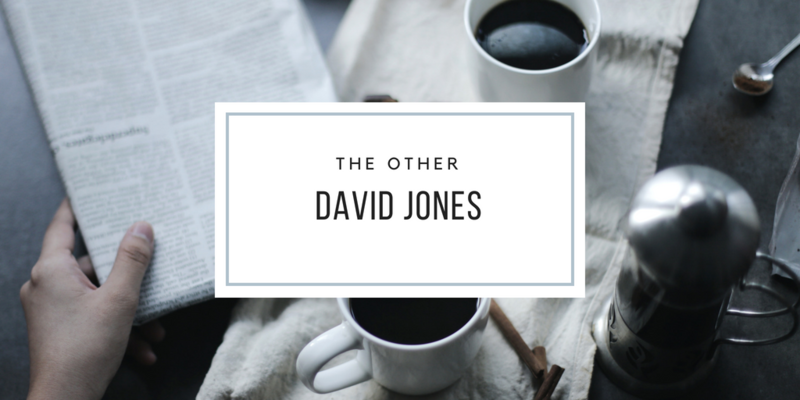 At last, David Jones in longer form. This will be good! Looking forward to what you have to say! This is so cool! Looking forward to seeing what you have to say! Always enjoy reading your statuses. Cant wait to see what else you got up there!